Doubles tennis games begat early Thursday night Dangerous sports which, around 1994, begat several small gatherings of men in smoke filled rooms. Gossy expressed an interest, Tarr, Jay and Rowan chipped in, Russell, Moore and Carter whittered on. And thus a cricket club was born. From these early primeval stirrings the Bernasaurus, then as now, took the baton, ran with it, got fixtures and spread the news to anyone interested in playing. He invented the Club name. Sounds like Somerset C.C to the hearing impaired but reminiscent of fully ripened maturity and being knackered. And good practice for stammerers. I think Jo designed the excellent logo which is, of course, incorporated in our handsome caps which we’ve had, more or less, since the Club’s inception. Our first ground was to be at Exminster, the connection being Jack played junior football for St Martins. An artificial wicket, a bumpy outfield, splendid views and boozy clubhouse made an interesting first home!!! Thus it came to pass that our first season was 1995, our first game being against Kenn C.C away which we lost. We drank in the Ley Arms, the first ever team being Wilson B, Moore, Tucker, Forey, Young, Hitchcock, Tansley, Dalgleish, Harris, Carter and Wilson T. We played eleven games in all, interestingly only one of which we still play, Plymtree C.C. In 1996, John Foray, one of our younger players got married. Whilst working for Kneel’s laundry, John was able to acquire a set of used white trousers from the St Merryn meat company which he kindly sold off to Sunset members. The blood stains on them soon wore off after a few washes but, by hecky, until then we looked a ferocious bunch when fielding. In 1997, we moved our home ground to Woodbury, much more genteel. Thus began our long friendship with Cyril, scorer extraordinary and later, on the sad death of our first President Bernie’s Mum, Peggy in 2008, the second President of the Club. As the Club became more well known, more and more players expressed an interest in playing for us as they liked the way we played the game and wanted to play the occasional match rather than the more intense commitment that playing for other clubs would involve. The bonus for us was that several of these blokes were good players which meant we could at least hold our own with most clubs who play our kind of cricket in the area. In 1998 we played twenty fixtures, Steve Waters scored our first century at Gras Lawn and sadly we lost Rob Parrish, who amongst all his other accomplishments, sometimes played for us. Since 2000, the Sunset Strip, which has been recording all our matches from 1995, has been printed by friends at Exeter College for which we are most grateful. The cover of this handsome new format features the young Max Burrows leaving the field after scoring an undefeated 50 against Woodbury CC. The year 2000 saw the start of Sunset’s mini tour which includes a fixture against Lynton and Lynmouth at the famous Valley of the Rocks ground. This tour continued with a game against Westleigh on the Sunday. The Valley of the Rocks remains a feature as does the Summer tour. Who can forget the Bodmin/Wadebridge mini tour in 2001 or the Trengilly Wartha Experience in 2003? 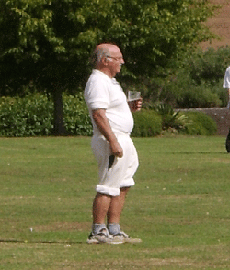 The decline in our fortunes in the Branscombe 6 a side tournament is chronicled in the 2005 Strip: 2003 WINNERS, 2004 Runners Up, 2005 the wooden duck. The sudden death of Mark Burrows cast a shadow over the 2004 season. He loved playing for us, was a very good cricketer and a lovely bloke. His name lives on in the form of a beautiful trophy, carved by Howard Donaldson, another Sunset player and is now the award for the Sunset Player of the Year. The Noughty years roll on and the Club prospers. More players want to play, Bernie gets new fixtures which take us to different and lovely venues. A few clubs are dropped as they are unable to honour the fixture. Our relationship with our host club, Woodbury is sound, thanks to Bernie and his contacts. The arrangement with Jim and his staff, food and hospitality after the game at the Maltsters, is a cracker. So much so that in 2002 the inaugural Charity Match with the Maltsters, took place. This event, together with money raised at our annual Award’s Evening greatly enhances the amount of cash we can lob over to the Club’s charity of choice for that year. Which charity we support is suggested by a player or his partner, a tradition that stems back to the Club’s beginning. As I write this in February 2010 for our spanking new website, the big news is our change of venue next year to the Coaver Club, which is the social club for Devon County Council. Reasons to be cheerful about the move might include its situation in the heart of Exeter, excellent facilities to watch the games from the balcony, good showers, wide range of reasonably priced beer and a fun place for post match entertainment.